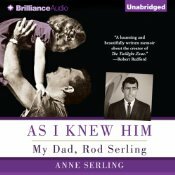 AS I KNEW HIM by Anne Serling is an honest, revelatory, and fascinating memoir of one of television's most original and provocative writers, Rod Serling, told by his daughter in loving memory. 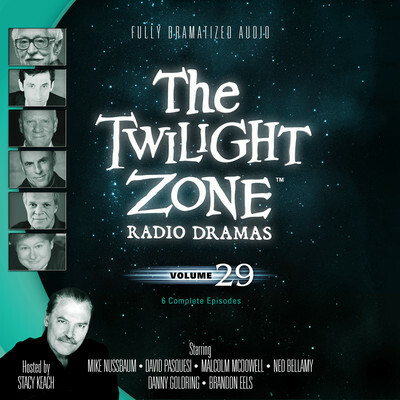 Serling reads her book on audio, and paints a portrait that is anything but dark. Recalling a personal life with her father, she reveals a complex man with a silly sense of humor, deep political convictions, and boundless imagination. Not only does she comment on all of his works, but she reads letters from her father, and shares his reactions, opinions, and complaints about the machine that is Hollywood. Who is this enigma of a man with a cigarette? You will know after hearing this book. Serling won multiple Emmys during his career, but more than that he was unafraid to unmask the prejudices and flaws of those more interested in perpetuating the status quo. Some of his scripts were tongue-in-cheek simplistic, but others were masterpieces, such as "Requiem for a Heavyweight" and the ending to the movie "Planet of the Apes" (for which he was credited.) Much of what he wrote has relevance for today, such as this quote: "Poverty, hunger, racial tension, pollution are here and now. These are the things that scream for a response. And if we don't listen to that scream…and if we don't respond to it, we may well end up sitting amidst our own rubble, looking for the truck that hit us, or the bomb that pulverized us. Get the license number of whatever it was that destroyed the dream, and I think we will find that the vehicle is registered in our own name." My interview with Anne is HERE.